Sam & Maneesh’s wedding was one of the most joyful celebrations I have ever been a part of! 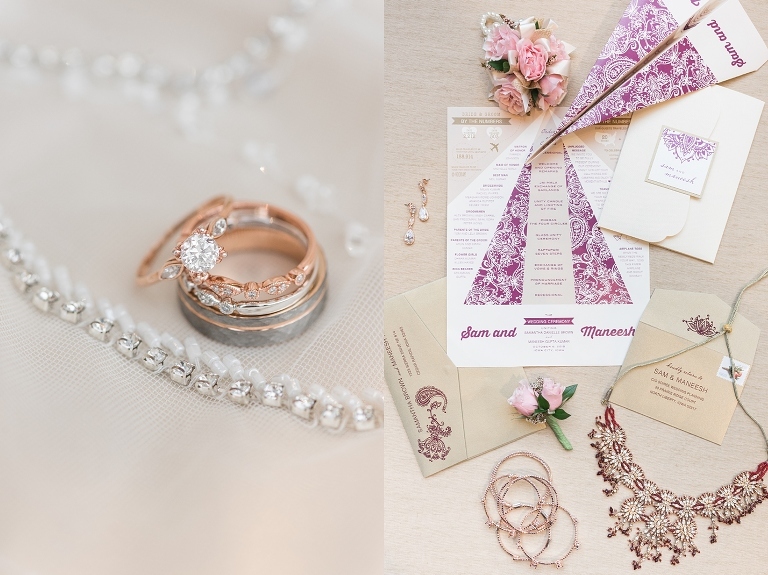 When we first met over a year ago to talk about their wedding, one of the priorities for their wedding was for it to be FUN and exciting celebration with their friends and family – and they definitely checked that one off the list! All day long, people were smiling, hugging, congratulating, and dancing – literally ALL day! Most Indian weddings are filled with music and lots of dancing, and their day was nothing different. They blended together traditions from Maneesh’s Indian heritage, and also made sure to tribute to Sam’s roots as well. Sam was such a gorgeous bride! She wore an elegant beaded gown similar to most western weddings, and added a beautiful scarlet red dupatta that was a gift from Maneesh’s mother. 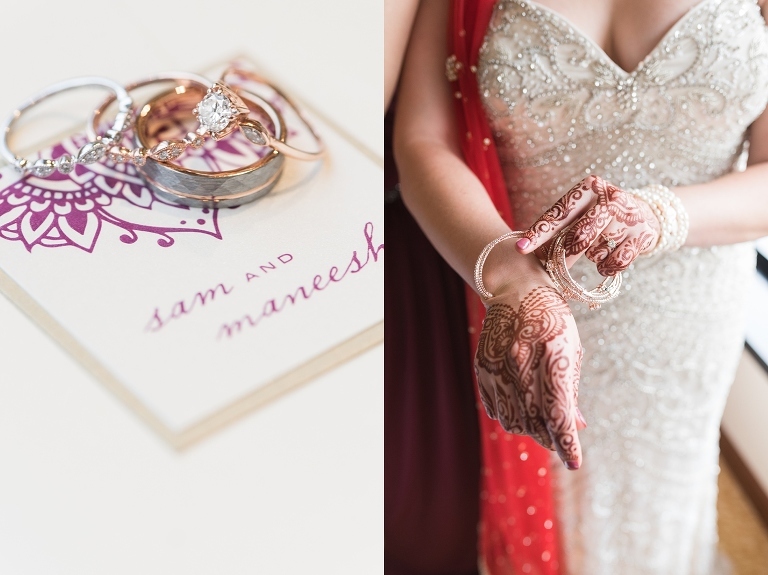 Their ceremony was a mixture of Indian and western traditions – held under a beautiful Mandap, they exchanged garlands and circled the fire to symbolize their friendship and marriage. They also exchanged vows and rings, and had a candle and glass ceremony. It was an incredibly meaningful and beautiful blending of cultures and families! Throughout the day, their parents took part in many of the traditions and stood right alongside them. I could tell they were so excited for Sam and Maneesh! This culminated in both sets of parents joining Sam and Maneesh for an INCREDIBLE dance performance during their reception – what a way to kick off the evening celebration! I’ve never seen anything like it! Their day started when we entered the bridal suite, and they proudly proclaimed they were taking part in a traditional game played on most Indian wedding days – stealing shoes and holding them for ransom! Several bridesmaids had managed to convince the housekeeper to let them into Maneesh’s room while he was showering, and they actually stole ALL of his shoes. 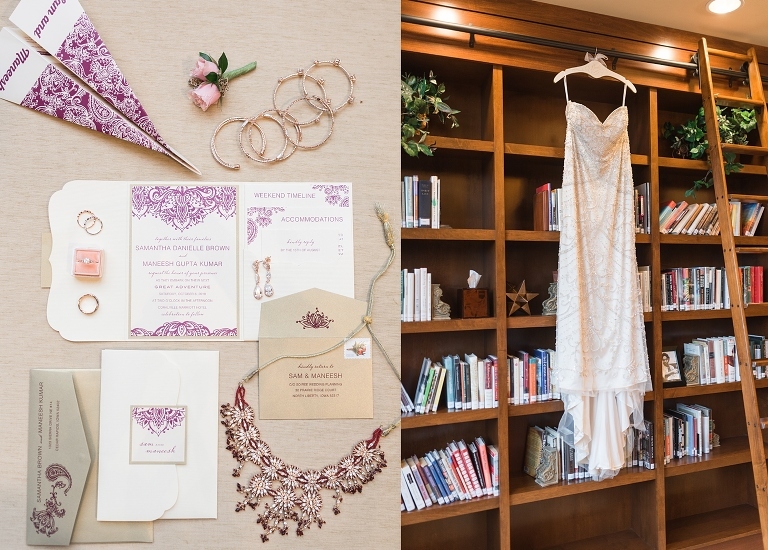 Held at the Coralville Marriott Hotel, there is the most beautiful library that was perfectly suited for Sam’s exquisite beaded dress. Also, I absolutely LOVED their invitations! The paper plane wedding ceremony program was the perfect finishing touch, an idea that came from their wedding planner, Emily from Soiree. I loved this moment when Sam’s two closest friends helped put her necklace on – carefully trying not to muss up her hair. Maneesh’s first look reaction to seeing Sam for the first time!!! I absolute adored this moment. We had one of the most frustrating days for weather – it rained, then it was dry, but incredibly wet. While we were unable to have their ceremony outside due to the unpredictable skies, we did manage to have outdoor photos, which I am SO grateful for! I loved the color palette that Sam chose! Beautiful Mehndi by Rayna. I was able to watch her do some of it during the Sangeet on Friday night, and it was mesmerizing. After their first look and group photos, we had a special time with the grooms family to prepare for the barat. The festivities are about to begin! If you had a sense for the crowd of people and the exuberant atmosphere – this was a PARTY! I loved when Maneesh danced with his mom! During the barat, the groom’s family travels to the brides family (traditionally, it would be between the villages) – for Sam and Maneesh, things were simplified a tad and we went from the front of the hotel to the back, though the journey took an hour, it was full of great fun! The beautiful mandap and decor throughout the day came together from Unique Events. The first part of their Indian wedding ceremony, they exchanged beautiful garlands with one another. Then, they literally tie the knot – each of them now joined to the other! Their ceremony programs folded into paper airplanes, which guests shower on them as they departed their ceremony. After their ceremony, the ballroom was transformed into an incredible space to celebrate! It was beautiful! Custom luggage tags served as place cards for their guests. Such an amazingly stunning space! Sam and Maneesh surprised their guests with a choreographed dance that was perfectly sweet, and just a little bit quirky. It was definitely very them! After their first dance, Sam and Maneesh shared a dance with their parents, that then led to an amazing Indian dance full of energy and excitement – the crowd LOVED it! There are SO many more I could share! I literally have thousands of photos that I love from their day! But this gives you a small taste of how wonderful it was!